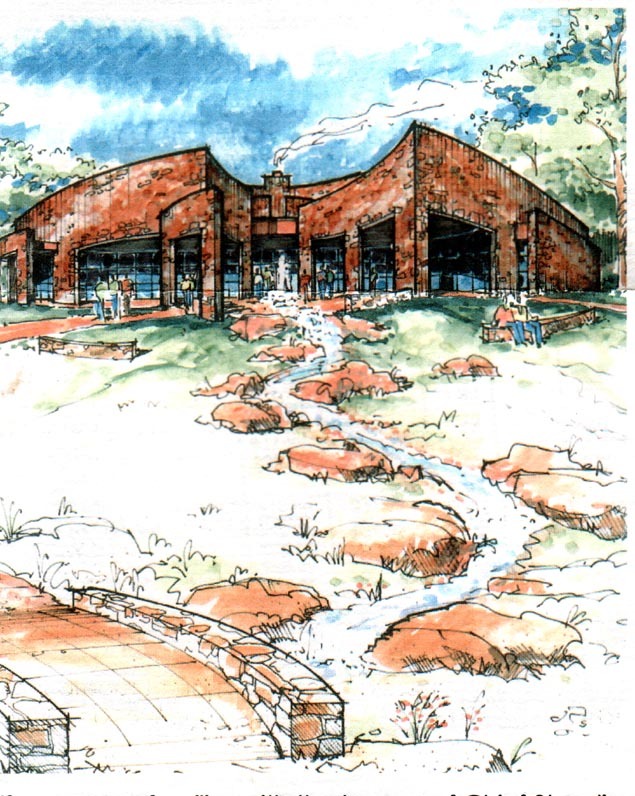 This illustration is a design for the proposed Standing Bear Museum and Education Center at Ponca City, Oklahoma. The architect, Whit Todd, says, "This new center is unique in that it will include cultural aspects important to all six tribes, as well as elements representing Earth, Water, Fire and Wind." "This new Center is significant in that it will help convey the importance of Chief Standing Bear and how the events of his life play a valuable role in American History." Mr. Todd continues, "this new Center is important because it will provide a meeting place, a place for long-distance learning and a much needed permanent facility for the Memorial Park. Finally, this new Center will soon become a new landmark for Ponca City." "If you are not familiar with the legacy of Chief Standing Bear, I recommend that you learn this fascinating and historic story. I also suggest you visit the Memorial Park." "If you are already familiar with the legacy of Chief Standing Bear, I urge you to help. There is a critical need for funding. Not only for the maintaining the beautiful Memorial Park, but also for the administrative costs and construction of the Education and Welcome Center. Furthering the Standing Bear project is important on many different levels, and you can play a vital role." No doubt about it, this has been a rompin' stompin' Oklahoma year. We have set our mind to a number of projects and carried them through much to our own surprise. The new plant going in here is rapidly progressing right along. Rodney came out of retirement just for a while, partly because they asked him and partly because he just can't resist the challenge of seeing the coming to town of a promise of new jobs. Conoco and Phillips oil company's are one and the same here now going by the name of Conoco Phillips. There was quite a transition to be made by folks as they either transferred to Houston, Bartlesville or accepted lay offs here. Everything was in a mood of change with people having to uproot their lives and start all over somewhere else. As the oil people had to conform to their new jobs whole families were having to make a move. Our handicapp daughter has been enjoying the used spa her father put in for her. The lift to get her in and out cost more than the spa but for the joy she has and relaxation from the warm waters is a wonderful investment. My other daughter with her father's help and building her own house was an inspiration to all of us. She did work at the computer for Conoco but is now enrolled in school. She wants to work somewhere in the medical field, maybe psychology. Building her home will give her a less expensive life style as to rent and she will be able to spend more time studying rather than working full time. She definitely has a broader education as to framing, flooring, electrical wiring, sheet rock, tapeing and bedding sheetrock, carpeting and painting. She went ahead with the work uncomplaining, doing it well, even though she had never had any experience other than helping her father pull wire when she was a kid. Her husband and his family helped her with the impossible work. The roofing and the ceilings with lifting sheet rock. They also did the heavy moving for her. Without them she could not have built her house. Working long hours to complete the project is going to give her time to be ready for school in January. Because of redirecting money toward the terrorist protection it is my understanding the Standing Bear Museum has been put on hold, which is really a let down. We all had so much looked forward to the new museum which would have complimented the park, statue, and nature trails. After a couple of rocky weeks the four year old grandson finally made the transition from home to school where he is loving every minute of it now. The Standing Bear Pow Wow gave us a chance to display some of our arts and crafts in a booth. We had fun with that. The children, of course, liked it too. Now they are more inclined to sit down with Gramma to work at any particular project she is doing. This is a big help. We had visitors from California. Family who we had never met and it was wonderful. They had good looking kids and we are proud to be "kin." We did everything in our power to try to give them a good stay with hospitality so they have more understanding of the people and culture in our area. My son finished his studies on a topic and passed his test for license and we were also very thankful for this too. I told him it would probably rain a deluge because we were all doing a rain dance around the kitchen table when we heard the news. All in all it has been a wonderfully busy year and we are very thankful to have been able to struggle through. Dear Family, and friends who have helped me. Senator Muegge referred me to Senator Harrison and he referred me to Harvey Payne, attorney at Pawhuska regarding the suggested museum to honor the family name. Senator Muegge, and Senator Harrison, along with the Historic Records Department of the Federal government feel this is a worthy project. These are the scales to tip the weight of society toward those of us in this family to reward us in whatever way to protect and further our survival with our working to encourage society by setting our history as an example of what hard work, dedication to family, did at one time accomplish. However, after I spoke with Harvey Payne I realize there have been no further ways I could go on with doing this work without any hope of an accomplished end. He felt that I should own the property in order to continue. There has never been any desire for me to "own" the property. My desire was simply for a united effort between we of the family to work together on a project. It seems those who are not of the family are stronger at this point than we are, and it is definitely their only interest to stand between any development to opening up jobs to our young people and that interest is only their need for revenge for some imagined wrong or whatever, or personal profit. It is sad to me because there are competent people among our young people who could use the work and what an encouragement and an honor to work on something that would bring pride to their ancestors and to their own grandchildren at some place in the future. We have those in our family who are grant writers, workers in the medical field, historians, film producers. We have those who are gifted with caring for the land, who have degrees in business management, geology (for the study and preservation of the rock wall). There are young people who have parents who are successful business people, pioneering their own positions into a monied society. These young people have "absorbed" their parents abilities but are ready to do something on their own. We have a computer genius who needs a station to hold him, free from the terrors and stresses of big business and big cities because of his delicate health. To the gentleman in California who successfully stopped progress let me say I know his God, and I know this God does not approve of denying succor and promise of hope to a younger generation. For whatever motives of revenge or greed or of not being able to get past those old scars he has the knowledge to know of what he did. To remain in a position of and as being a judge will,probably, be denied him too: since, we cannot be a judge and hold old angers and hatreds, especially when this brings harm to an innocent generation. I appreciate the help of the web mistress for the site she designed and I will leave it up in hopes someone will benefit and learn from it. When I tried to have her list these thoughts on the web page she did not want me to give up my dream. Believe me, it saddens me not to have been a strong enough leader to pull things together for the health and well being of the young people in our family. As I told Mr. Payne, at this point in time, all my work, recording, filming, organizing historical facts all free gratis will just have to go on the shelf. I believe in a higher power, and it is in this way I will continue to pray for our young people as I do nightly listing them all by name and this in itself is an exercise for this old gray matter.